Suffering from Neck or Shoulder Pain? We treat painful necks and shoulders on a daily basis. This does not necessary mean that each neck or shoulder is the same as the other. In order to determine the cause and get you better, we take time in getting to understand your pain and then assess the painful areas to identify the exact reason. Whether you have had a recent injury or been suffering from pain for a long time, we can pave the way to getting your neck/ shoulder feeling better. We treat neck and shoulder injuries every day and are experienced in not only using treatment techniques to reduce your pain but to empower you with all the information and advice you could need to get lasting improvement. We never "over-treat" our patients and most patients with neck or shoulder pain get improvement within three to four visits. Our therapists are dedicated to keeping up with the latest evidence-based practice and information. If your answer is no, don't worry. Although we will give you some exercises to do at home or at the gym, this is not the only thing that we do for neck/ shoulder pain. Exercises can also be incredibly hard to fit into a busy schedule, this is why we use an amazing new exercise system called Physitrack. 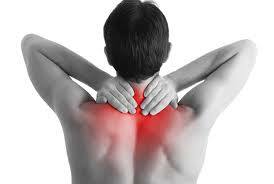 ​​If you have Neck or Shoulder Pain, you should book in for a Sports Therapy/ Pain Treatment session. ​"My physio recommended that I have a deep tissue massage to help with constant neck and shoulder pain. Murray couldn't have been nicer and gave me a suitable massage followed by electrotherapy similar to a Tens machine and sports tape to assist with my bad posture - the joys of a desk job. I am writing this the day after my appointment and I am feeling a lot better already and also slept better.."
​"Having had only 3 sessions with Murray (after 6 years suffering back/neck problems and endlessly searching for the perfect therapist) I am amazed at how quickly my pain has subsided! Murray is great at what he does in a professional, welcoming and friendly clinic. I would definitely recommend him over anyone else I've been to!" ​"I saw Murray a month ago as I've been experiencing pain in my neck and shoulder. Within minutes of Murray treating me the relief was amazing. I've been continuing with the exercises he gave me and will definitely see him again for follow up. " ​"'Fantastic sports massage and acupuncture with Jonathan Wilson today to help me treat persistent knee pain I have been suffering with. Extremely knowledgable and really took the time to explain everything to me. Thanks so much, will definitely recommend!" "Would highly recommend the Deep Tissue Massage. Went with queries about strength/ CNS activation and imbalances. Murray isolated and released muscle tension in traps, pecs, hamstrings in one session. Brought my attention to a pelvic tilt and rounded shoulders/ how these could be improved. Left with tape to help improve posture. Super friendly and relaxed session." "I have had a shoulder injury for the last 10years and been receiving treatment back home (Aus), after travelling for so long my shoulder has been restricted in movement and causing pain, after 2mins of working on my shoulder Murray gave me back full range of movement and relieved the pain that has built up, its nice to finally find someone that knows what they are doing, can fix the problems, explain what is going on and give advice on how to improve the injury. I haven't felt this good for so long. Thank you and will definitely recommend! Super star"
​"Murray is incredible! Very professional and has dramatically improved my neck and shoulder pain. Highly recommend."